Looking for unique and delicious pies to serve this Thanksgiving? Maybe you've had some good luck with store bought pies, but now you're ready to go beyond classic apple and pumpkin and try something new this year. Well, look no further–these pie recipes range from creative to classic, from fancy to fresh. We've also included some fantastic homemade crust options for the daring chef. 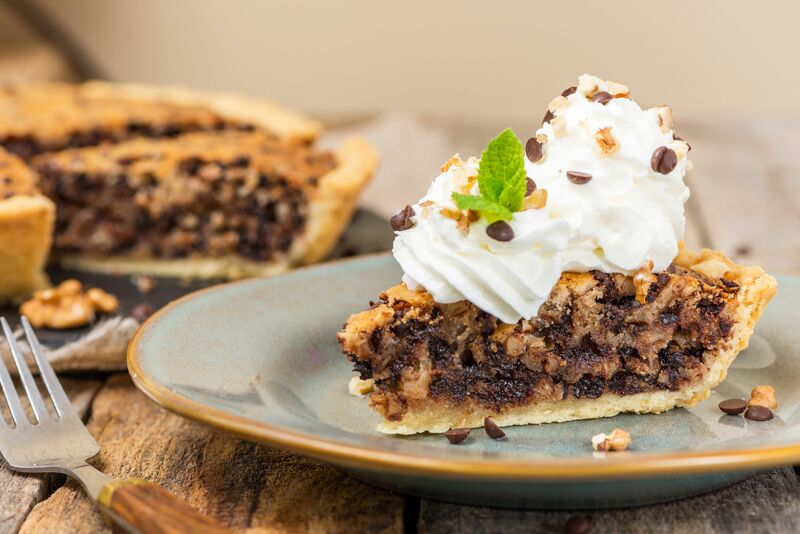 This pie may be a Kentucky Derby tradition, but it also makes for a delicious Thanksgiving dessert. Chocolate and walnuts are a great fall flavor combination. If you're looking for something tart and fruity, then this is the pie for you. We reccomend using Bramley or Granny Smith apples. What would Thanksgiving be without an apple pie? This is an easy and classic recipe that everyone at the table will enjoy. This is another great dessert for the chocolate-lovers at your Thanksgiving dinner. The texture is smooth like custard and the flavor is rich like a brownie! With just the right amount of spice, this recipe makes the perfect pumpkin pie. Pair it with whipped cream or vanilla ice cream–or both. Maple, brown sugar and pecan are a match made in heaven. This buttery fall pie will win over all of your guests. For a healthy and guilt-free dessert, try this vegan tofu peanut butter pie. If you love pretzels, chocolate and loads of PB, this is the pie for you. Look no further for the ultimate Thanksgiving chocolate pie. This recipe is the perfect dessert, complete with whipped cream topping. Forgot to prepare a dessert for Thanksgiving? In a rush? These 10-Minute Banana Pudding Pies are a fantastic fix when you don't have a ton of time to make a fancy pie. If you're already stressed on Thanksgiving and looking for a pie that's easy to make, but still delivers on delicious taste, we definitely recommend this apple cranberry pie recipe for a simple taste of the season! This delicious and healthy vegan blueberry pie uses Phyllo crust, which saves you a ton of time and energy. If you're feeling ambitious, you can try making your own crust instead. With a dairy and a gluten allergy, you probably thought you'd never be able to have pumpkin pie at your Thanksgiving (or at least a good one). With this great recipe, using gluten-free flour and coconut milk as substitutes, you'll be able to experience this Thanksgiving favorite. We recommend tart cherries for this classic cherry pie. While cherries are in season in the summer, fall is the perfect time for delicious tart cherries. If you're making a meringue pie this Thanksgiving, this is the ultimate recipe. Use superfine sugar for the best taste and cream of tartar to add stability to your delicate creation. Rhubarb pies are a seriously underrated fall dessert. Serve this delicious dish up with buttery oats, vanilla ice cream and an after-dinner cocktail. Apple pie is a great standby and a classic dish on Thanksgiving, but try mixing it up a little with a fresh pear pie, topped with beautifully latticed crust. We know this isn't a pie recipe, but this cheesecake is so perfect for fall and Thanksgiving, we had to include it. This is easy to make using the same canned pumpkin you would use for pumpkin pie. For an extra zing at your Thanksgiving table, try this bourbon-infused pecan pie: a classic southern dish that will be sure to keep the party going! Impress your guests with this easy upgrade from a classic apple pie. Pick your favorite kind of apple, or even mix a few together! Using ready-made pie crust dough makes this recipe even simpler. This no-bake yogurt and cool-whip pie is as easy as it is refreshing. Spend less time in front of the oven and more time with your family by serving this delicious dish at your Thanksgiving. Fresh strawberries, custard filling and easy store-bought pastry shell come together in this sweet strawberry cream pie. If you're sick of apples by Thanksgiving, a strawberry pie is a great way to switch up your dessert menu. Pair this pie crust with a gluten-free pie filling and you're all set for a healthy and inclusive Thanksgiving dinner! Not a fan of graham cracker pie crust? This is a delicious recipe for creating a flaky pie crust without any gluten! This fluffy and light hot water pie crust is unbelievably easy and seriously delicious. This unique recipe is sure to be a hit in your house. A flaky crust that will go well with any Thanksgiving pie. We reccomend using butter for the ultimate flaky experience and the best possible flavor.